Last week the Snickerdoodle and I were both sick with colds. His made him pretty crabby for a couple of days, mine made me really crabby (I don't believe colds should be endured without pharmaceuticals but pregnancy dictates otherwise) so we pretty much just stayed home most of the week. We were getting a little bit of cabin fever so I got to thinking about making him a new toy to play with. 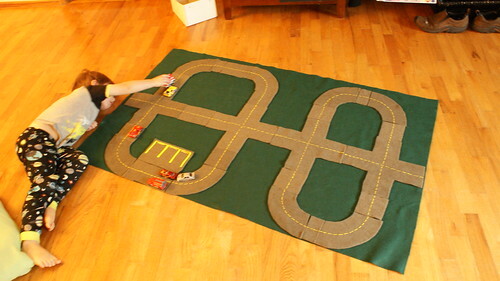 I dug into my fabric stash and created for him a modular road set for his die-cast cars. Note: The measurements I'm going to provide are based on standard matchbox style cars up to the Cars2 size (which are a tad bigger). If your child has different vehicles, adapt accordingly. Cut your background to size. It really doesn't matter what size, my piece was based on some left over fabric I had from last year's Advent calendar. 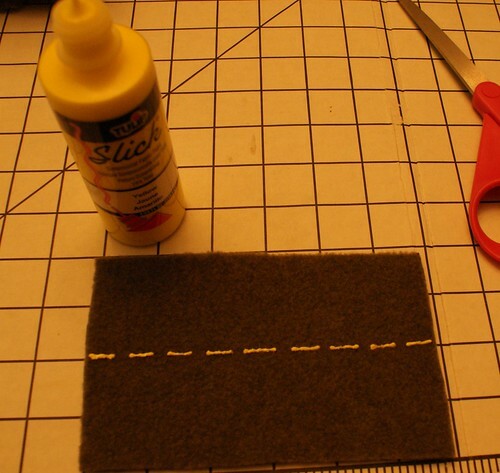 Lay out your road fabric on a cutting mat if you have one. 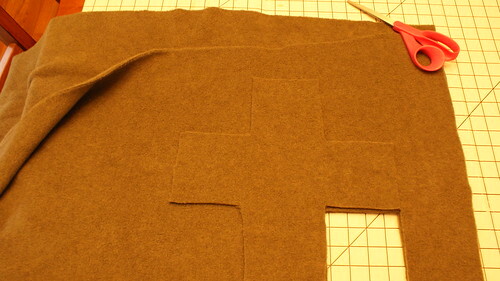 I used my cardboard fold-up one so I could follow the straight lines. 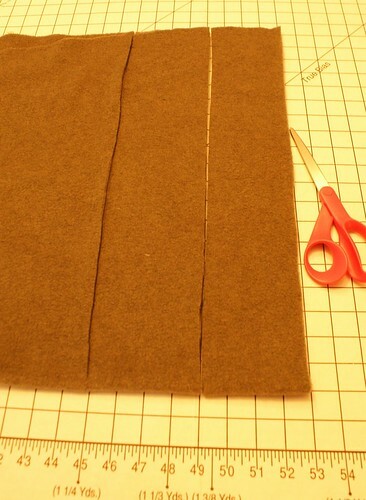 Cut in strips 4 inches wide. 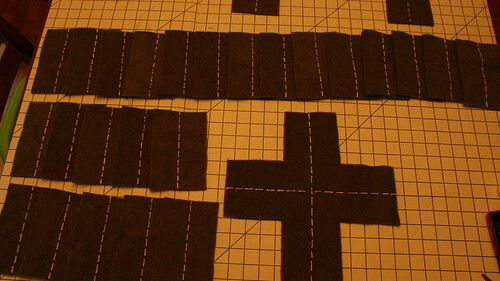 Here's where I made a mistake - I cut my road pieces to 6, 4 and 2 inches long. I suggest you go with 8, 4 and 2. I found that the fewer pieces we had to use to make a road, the fewer pieces Snickerdoodle had to replace after a car went speeding by. Ultimately he learned that this wasn't a race track but he did get a little frustrated at first with the pieces that moved. Cut out some intersections as well as any other shapes you might want (in the end I did some curves too). Using your craft paint, create dotted lines down the center of all your road pieces. Allow the paint to dry then start playing!! He doesn't know it yet but I figure I can add buildings (flat of course) to it too. 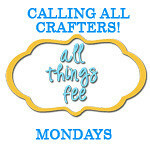 This could be a great ongoing destash project!